A property located at 105 E. Kelly Park Road in Apopka, Fla., reported periodic flooding with runoff from the abutting roadway drainage system. Drainage improvements had been installed along the north and south sides of the road eight years prior, intended to direct the water away from the private property where the flooding was occurring. On the north side, the existing collection system consisted of curb and gutter with curb inlets and flumes that collect runoff from the roadway and direct it to a concrete stilling basin, which eventually outflows over a concrete weir from the existing structure in the northwest direction away from a low-lying parcel owned by the county. The swale on the south side of the road is segmented by multiple ditches, blocks and driveway culverts, and ultimately outfalls to the concrete stilling basin on the north side of the road via an 18-in. reinforced concrete pipe connection that crosses Kelly Park Road. Storm water from south Kelly Park Road is collected via curb inlets along the road and discharges to the swales over flumes at the back of the inlets. Recently, the same resident alerted the county that the property continues to flood despite the installation of the drainage improvements. The maintenance crews removed the concrete bottom of the stilling basin to promote some percolation, but the bottom continues to become inundated with silt, effectively inhibiting percolation. The soils within the project area are designated as type A, which is characterized by its high infiltration capacity. The rapid movement of water through the soils has contributed to the problems with the drainage infrastructure. Multiple washout areas below and around ditch blocks in the south swale indicate that storm water currently short-circuits the ditch blocks and flows around them instead of staging up within the swale to provide storage. Additionally, the swale side slopes have multiple washouts and rutting. Hence, the swale section upstream of one ditch block has been entirely filled in by sediment, rendering it useless for providing storm water storage. To resolve the flooding without purchasing property for a retention pond, the options of retaining as much runoff as possible within the existing right of way were evaluated. Consulting and geotechnical support services were sought out to assess the soils and water table conditions in the vicinity of the project and find a reasonable retrofit to address the issues. 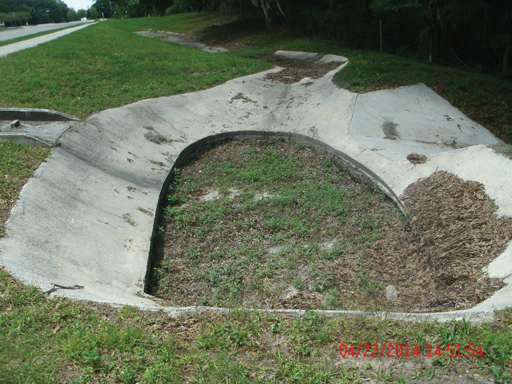 Installation of catch dams within swales to reduce the velocity of storm water flow. The exfiltration system would comprise slotted pipe placed within a trench in a bed of gravel and wrapped with geotextile. The pipe would connect to ditch bottom inlets that would be constructed with sumps for settling debris, a skimmer for floating debris removal or a weir to control storage levels, and a weep hole at the base to allow for additional storm water infiltration. 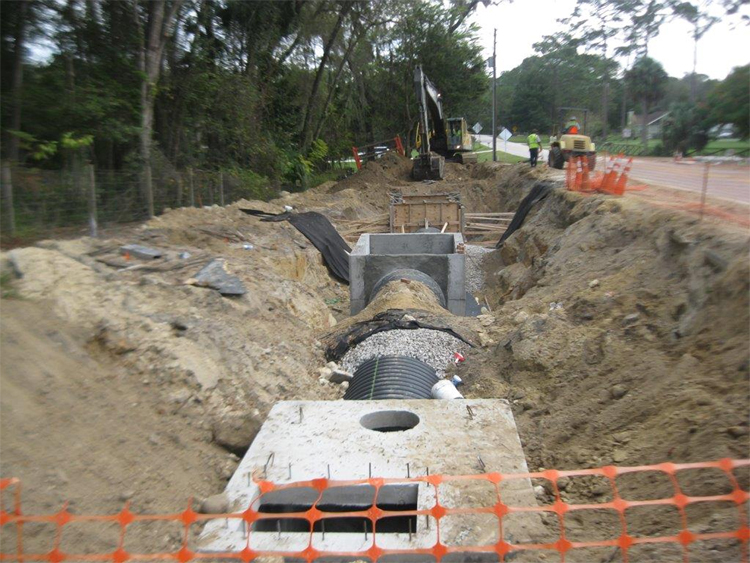 The slope of the pipe would be flat and the inlets would be equipped with weirs to hold back the storm water from smaller events in order to increase the detention time and promote maximum infiltration into the ground. Large flows would overtop the weirs and be discharged out of the system. Crews removed the concrete bottom of the stilling basin, but it continued to become inundated with silt. Buried clayey fine sands and clays within the exfiltration area had to be removed and replaced with clean sands to improve infiltration. The cross drains under Kelly Park Road conflict with an existing city water main within the county right of way. The city staff worked with the contractor on the relocation of the water main within the conflict zone. During the excavation to construct the exfiltration trench at the north side of the roadway, the contractor encountered an unexpected rock outcrop that conflicted with several of the proposed drainage structures, exfiltration trenches and pipes. The rock had to be broken up by jackhammer, delaying the progress and curtailing a few of the sumps within the drainage structures. In addition to not constructing the sumps, 12-in. weep holes had to be constructed on the north and south walls (non-pipe opening walls) of the impacted drainage structures, and a 1⁄4-in. galvanized hardware cloth with geotextile had to be installed to prevent the inflow of the exfiltration trench media. The vertical infiltration is already limited due to the design conditions originally used (seasonal high water table and base of aquifer). Therefore, the presence of the rock outcrop beneath the exfiltration trench will insignificantly impact the recovery time and performance of the exfiltration system. The horizontal infiltration is the dominant drawdown mechanism for the exfiltration system. The runoff will continue to migrate horizontally outward above and down the excavated rock trench until it passes the rock outcrop confinement, where it can continue to infiltrate horizontally outward from the exfiltration trench. Based on preliminary calculations, the exfiltration system’s recovery time is estimated to be less than 24 hours. The maximum recovery time for exfiltration is typically 72 hours. Assuming a conservative 5% decrease in exfiltration trench length, the increase in recovery time would be approximately 1 to 2 hours— still within the typical recovery time for exfiltration systems. The structure sumps collect trash and debris. Because the structures that are being impacted are close to the downstream end of the system, most of the trash and debris would already be filtered out of the runoff by the time it reaches the modified structures. Also, each structure has an internal weir plate that will aid in collecting the debris. The original design modeling for flood control did not account for any infiltration. Therefore, the system will meet the same level of service for flood control as originally designed. The adjustments necessary due to the unforeseen outcrop rock are not expected to significantly adversely impact the performance of the exfiltration system. Due to the challenges encountered, the project was scheduled to be completed by late 2015; however, the winter holidays, combined with rainfall and early periods of cold weather in late January 2016, the project finished 12 weeks behind the original schedule and is now fully operational. The design and final construction cost was $474,000. Despite the challenges, the improvement will provide the affected citizen with an improved drainage system and enhance public health and safety. Deodat Budhu, P.E., is manager, roads and drainage division, for Orange County, Fla. Budhu can be reached at [email protected] ocfl.net or 407.836.7919.